The appeal of Livy, the great historian of the Augustan age, lies both in his riveting storytelling and in the sophistication, clarity, and accessibility of his prose. Aiming to preserve the memory of Rome's achievements and morally rejuvenate his contemporaries, Livy takes readers on a tour of Rome's past as he thinks deeply about historiography, its uses, and its challenges. Teaching Livy's Ab Urbe Condita in a college-level Latin course is guaranteed to yield valuable returns: in developing student's language proficiency through Livy's diverse and complex prose style, and in cultivating an interest in Roman history and culture through vivid characters and descriptions. There are many editions of annotated texts with commentaries for instructors to choose from for the intermediate and advanced Latin student, some with paraphrase passages and some presenting Livy's original text. 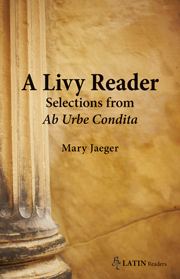 New on the scene is Mary Jaeger's A Livy Reader: Selections from Ab Urbe Condita, a thoughtful and well-annotated edition of excerpts that pushes students and instructors to engage critically and carefully with Livy's history at the level of both style and concept. As one of Bolchazy-Carducci's new Latin Readers (under the general editorship of Ronnie Ancona), A Livy Reader is organized according to the series' specifications: an introduction by the author, a bibliography for further reading, 593 lines of original Latin and associated commentary, and a full glossary. Everything students need to work with the text is (mostly) contained within it; occasional notes directing the reader to C. Bennett's New Latin Grammar mean that students might want to have it handy as they read. Jaeger's introduction provides a firm foundation to Livy the historian, the work he produced, and his historical context-and is appropriately suited to an audience meeting Livy for the first time. There is information on Livy's origins, his education, his unwavering dedication to historical writing, and the absence of evidence for a political career ("Livy's Life and Times"). Jaeger emphasizes the limitations that exist in writing Livy's biography due to his own silence and the meager (and uncertain) information from other ancient sources. On the question of Livy's political leanings, Jaeger walks a middle road, telling students that there is evidence for both his republicanism and support for the new Augustan regime in his history. There is brief discussion of what Livy included in his history, what survives, and the structure of this massive work ("Livy's Work, Subject and Scope"). From the start, in presenting these details and debates around this historian, Jaeger models how to think about history and sources in a critical way. As the introduction continues, Jaeger shows the student how and why Livy wrote his history, two of the main themes driving this volume. We hear of Livy's many sources-oral traditions, the Annales Maximi, and the work of previous historians-and how he might have adapted them to his purposes ("Livy's Sources"). Through a discussion of why Livy wrote his history-part and parcel of his interest in human experience and character-Jaeger makes clear the themes linking the passages students will read ("Livy's Ideas"). Students are also given valuable insights on how to read and assess Livy's style through thorough and informative close readings of one paratactic and one periodic passage ("Livy's Artistry"). Presented with a taste of what is to come, students begin to see how style can contribute to meaning and note strategies for reading the text accordingly. In her preface, Jaeger acknowledges the difficulty in selecting passages from the many rich, and also sometimes canonical, episodes found in Livy. To do so, she draws widely from the extant text, with passages that expose students to Livy's narrative style, his rich descriptions, and his speech-writing skills. The selections are lively and intriguing: chapters 6-10 of Livy's praefatio allow students to hear the author's motivations for writing history; the competitiveness between Romulus and Remus presents a "classic" story for which Livy acknowledges two versions of events; from Book 2, Horatius, Mucius Scaevola, and Cloelia give students a sense of Romans at their most patriotic and courageous; Manlius and the Gaul reinforces the contrast between Romans and their enemies in times of conflict, a theme that is built upon with selections from the conflict with Hannibal in Books 21 and 22; and excerpts from the Bacchic conspiracy demonstrate the consuls staving off internal turmoil, along with rich descriptions of the "depravity" of the Bacchant worshippers. Jaeger frames these episodes at the start of each new section of commentary, introducing the passage at hand, while also making informative links between passages, even if, at times, great leaps in time and space are made. One can foresee lively discussions emerging from these passages: what it meant to be Roman, what qualities a good leader should have, and the importance of perspective in writing history. On the whole, the commentary contains helpful and appropriate notes, although it takes some time to hit its stride. It does so in the passage of Horatius at the Bridge and thereafter, where the careful attention to the complexities of grammar and syntax will serve the intermediate student well. Jaeger pays careful attention to syntactic features necessary to master Livy effectively: indirect discourse, relative and conditional clauses, and the particulars of gerunds and participles. One would hope for a bit more help in the two passages that precede Horatius, especially because the Praefatio, which expresses complex, non-narrative ideas, will be difficult for students just getting acclimated to Livy. As one works through the Reader, the commentary grows with more notes concerned with style and conceptual issues and less grammatical help. The notes do well in indicating and defining the literary devices and emphatic word order with which Livy enlivens his history, enabling the student to get a real sense of Livy as writer. On a literary level, Jaeger assumes prior experience with the text of the Aeneid, and there are also notes referring to Ovid, Lucretius, and even Ennius; these might be lost on students with limited exposure to Latin literature. There are, however, also quite excellent notes on aspects of Roman culture and history that help to illuminate the meaning in Livy's details further (those on the episodes from Books 21-2 and the Bacchic conspiracy stand out most strongly). One exciting aspect of this volume is the potential it offers to develop class exercises in source criticism. Jaeger's early mention of her textual emendations exposes students to the process involved in setting an ancient text and opens up the possibility of exploring the significance of those choices for understanding. There is also the material available to juxtapose Livy's narrative to earlier texts. In the Manlius excerpt, students might be asked to compare Livy's account to that of the annalist Claudius Quadrigarius, as prompted by Jaeger: "Comparing the two shows how Livy's many changes in detail produce a very different cumulative result" (43). From the de Bacchinalibus episode students might debate the difference between Livy's (dramatic) account and the formal Senatus Consultus. Students interested in exploring scholarship on Livy's text will find Jaeger's bibliographic references helpful, with suggestions ranging from the general topic of historical writing in ancient Rome all the way to specific monographs and articles related to the selected passages found in the volume. Two maps appear at the end of the reader as appendices, one of the city of Rome and the other of the Mediterranean. They are set at a small scale, making them of questionable utility. In fact, the map of Rome could have focused on a detail of the Forum, Palatine, and the adjacent Tiber River (to situate the action in the Book 1 and 2 excerpts), while a map of the western Mediterranean would have allowed a finer resolution on those sites associated with the Manlius episode and the war with Hannibal. Overall, Jaeger's contribution to the Latin Readers series is quite welcome, offering an intriguing and fun edition to introduce students to Livy's text, while also pushing them to assess Livy as a stylist and storyteller critically. Although there is not enough Latin here to fill a full semester, this text could start a course on selected Latin historians or be part of a class on the Augustan authors. I am eager to adopt this text the next time I teach intermediate Latin.